An action group campaigning to keep the Egyptian Sekhemka statue in the United Kingdom has appealed to Egypt to support its efforts to impose a permanent export ban on the artefact. Last week, the UK Ministry of Culture placed a temporary export ban on the statue that was bought by an overseas buyer for £15.76 million in July 2014. The buyer, believed to be of Middle Eastern origin, has applied for a licence to move the ancient statue from the UK. A UK minister of state for culture decided to defer the export licence application until 29 July, which could be extended to 26 March 2016. 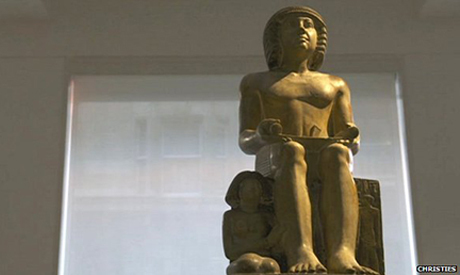 The Save Sekhemka Action Group (SSAG) doubts the legality of how the statue was brought to the UK. It has suggested that Egyptian authorities actively work on tracing the way the statue originally left Egypt. It is said that the Second Marquess of Northampton purchased and exported the statue from Egypt in 1850, and then gifted it to the Northampton Museum. However, SSAG suggested there is no documentation of the purchase and export of the statue to the UK. "We hope the Egyptian authorities expedite its efforts to find out if the purchase and export of the statue from Egypt was in accordance with then in force Egyptian laws on antique artefacts,” Ruth Thomas, deputy head of SSAG told Ahram Online. "While the group strongly believes the 4000 year old statute belongs to Northampton Museum, we support the idea of sending it back to Egypt, instead of it being owned by someone who takes it from the UK and keeps it out of display," Thomas said. According to UK laws, if the purchase and export of Sekhemka can be proved to be illegal, Egyptian authorities can seek to recover it. The UK Ministry of Culture told Ahram Online last week that "If a UK buyer makes a matching offer to the current owner, and the owner rejects the offer, then the UK Secretary of State could decide to refuse to grant an export licence." SSAG will be meeting in next few days to consider its next steps, Thomas said. Dr.HAWAS was TOO BUSY TO MIND HIS BUSINESS [collecting more money,GOD KNOWS HOW,we JUST GUESSING about]INSTEAD TO FIGHT with the museums abroad to BRING BACK AT LEAST TO MOST IMPORTANT ARTIFACTS like this STATUE and NEFERTITI'S BUST FROM BERLIN!!!! !These are PRICELESS TREASURES OF EGYPT!!! !Just as MUBARAK'S STOLEN MONEY FROM THE NATION [BILLIONS of $$$$$$$$$$ in banks abroad],the SAME SHAMEFUL STORY HAPPENED TO OUR HISTORICAL artifacts which are all over the world and NO a SINGLE POWERFUL EGYPTIAN LEADER FIGHTS TO BRING THEM BACK!!! !Is it REALLY THAT DIFFICULT TO LOVE EGYPT ,NOT just ONLY the MONEY????? ?